The sleek, contemporary look of this recliner will fit in any room easily. Upholstered in soft bonded leather. The swivel base ensures you will always have the best seat in the house. Easy reclining action allows you to relax at the end of the day. 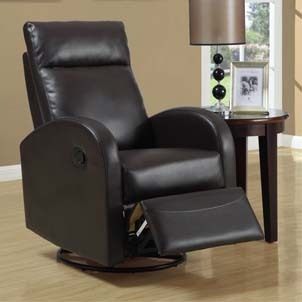 Key Features: The sleek, contemporary look of this recliner will fit in any room easily. Upholstered in soft bonded leather. The swivel base ensures you will always have the best seat in the house. Easy reclining action allows you to relax at the end of the day. Dimensions: Width: 29.5" Height:40.5" Depth:33.5"